Buy foreclosure homes for sale in Conneautville, PA, right now on Foreclosure.com for up to 75% off market value. 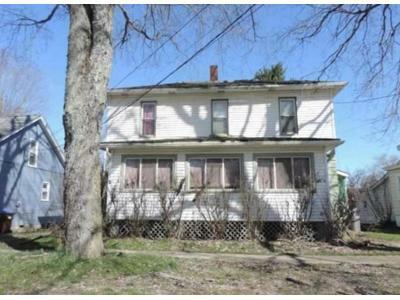 We currently have 1 of the hottest foreclosure deals in Conneautville, PA, of all prices, sizes and types, including bank-owned, government (Fannie Mae, Freddie Mac, HUD, etc.) and many others. Learn how to buy foreclosed homes in Conneautville, PA, with no money down and gain exclusive access to hidden distressed real estate listings in Conneautville, PA, 10 to 180 days before they hit the mass market. Be first with Foreclosure.com — find free foreclosure listings in Conneautville, PA, before anyone else. Conneautville is a borough in Crawford County, Pennsylvania, along Conneaut Creek. The population was 774 at the 2010 census. Conneautville was founded in 1814 by Alexander Power, a surveyor and engineer. Conneautville was first called "Powerstown" or made reference to as "Power's Tract". Power wanted it called "Conneautville" after the Seneca name Conneaut or Conneautee, meaning "Snow Place" according to one interpretation. Conneautville is in northwestern Crawford County at 41°45′29″N 80°22′10″W (41.758019, -80.369470), in the valley of Conneaut Creek, which flows north and west to Lake Erie. The borough is bordered by Spring Township to the north and Summerhill Township to the south. Pennsylvania Route 18 passes through the center of the borough, leading north 10 miles (16 km) to Albion and south 11 miles (18 km) to Conneaut Lake. Pennsylvania Route 198 leads west from Conneautville 8 miles (13 km) to the Ohio border and east 9 miles (14 km) to Interstate 79 near Saegertown. According to the United States Census Bureau, Conneautville has a total area of 1.0 square mile (2.7 km2), of which 0.004 square miles (0.01 km2), or 0.55%, is water. At the census of 2000, there were 848 people, 352 households and 229 families in the borough. The population density was 778.7 per square mile (300.4/km²). There were 377 housing units at an average of 346.2 per square mile (133.5/km²). There are currently 1 red-hot tax lien listings in Conneautville, PA.